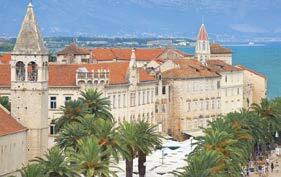 The island of Korcula is one of the highlights of Croatia cruise route T1. 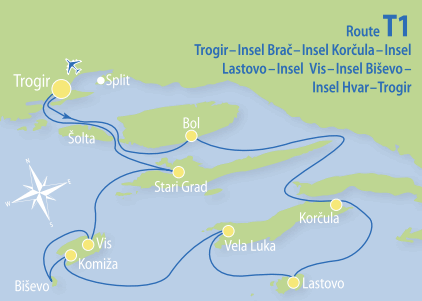 From 11:30 am to 1:30 pm, boarding time in the port of Trogir. If you arrive by your own car, you can proceed to the parking reception (as indicated in your travel documents) already from 10:00 am. Upon arrival, our staff will show you where to park and unload your car. Our service-team will take your luggage to the port. After embarkation, our representatives will welcome you aboard with a drink and you will meet the crew and your fellow passengers. After a lunch snack “Cast off!”, heading towards Bol, on the island of Brač. Here you will discover one of the most beautiful beaches in the entire Mediterranean – “Zlatni Rat” (the Golden Horn), which is constantly changing direction due to the ocean currents. Of course, you will have plenty of time for swimming and sunbathing at this famous beach. For guests arriving later with a flight booked by I.D. Riva Tours, transfer to Bol and boarding in the evening. Overnight stay in the port of Bol. Today’s destination is the town of Korčula, the main town on the homonymous island. Korčula has one of the most beautiful old towns in Dalmatia and due to its fortresslike appearance, it is often named “Little Dubrovnik”. Because of its vast pine forests the island in ancient times was also called “the Black Island”. On our way to Korčula, we will stop in a bay to take a swim in the crystal-clear water. Overnight stay in the birthplace of the famous navigator and explorer Marco Polo. In around three hours by boat from Korčula we will reach the island of Lastovo, which has been closed to foreign visitors for decades, since it used to be a military base at the time of the former Yugoslavia. The island has preserved its authenticity and is therefore an oasis of tranquillity, with lush Mediterranean vegetation. 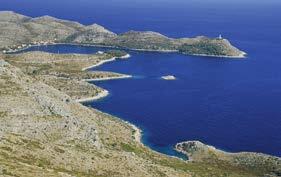 A few years ago, the archipelago of Lastovo was declared a natural park (entrance fee approx. € 3 per person, to be paid on-site). We anchor in the bay of Sveti Mihajlo, close to the village of Lastovo, where you will have plenty of time for exploring the surroundings. In the afternoon, we will return to the island of Korčula, more precisely to Vela Luka. The village lies in a deep, sheltered bay at the western end of the island. Vela Luka is not only the favourite theme in the beautiful songs of the Dalmatian “Klapas” (small, mostly male vocal groups, who often sing “a cappella”, i.e. without musical instruments), but it is also the birthplace of some of the most famous Croatian singers. In case of bad weather, instead of Vela Luka, we will anchor in the port of Ubli, on the island of Lastovo for our overnight stay. Today, after a swimming break, we will visit the second “forbidden” island of our journey – Vis. The island of Vis was, just like Lastovo, closed to foreign visitors until the end of the 1980s. Where once there was an Air Force runway, now there are vineyards. We will be staying in the port of Komiža, a peaceful town on the west coast. Before the trip to Komiža, we will visit, if possible, the “Blue Cave” on the islet of Biševo. Since the visit of the cave depends on weather conditions, it will take place on Tuesday or Wednesday, depending on the forecast. Overnight stay in Komiža. Just five nautical miles from Komiža there is the small island of Biševo, with the famous “Blue Cave” (Modra Špilja). Around midday, the rays of the sun will spill through an underwater opening into the cave and reflect from the white ocean floor, thus bathing the cave into blue light. This unique manifestation can be observed only in calm seas. 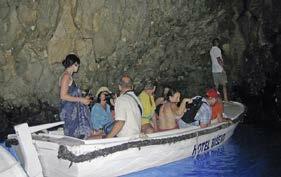 The trip to the cave is done with small boats (about € 5-7 per person, not included in the tour price). On our trip to Vis, the capital of the island, we anchor in a bay on the northern coast for a swim. The town of Vis is situated in a deep, sheltered bay. After a stop in a bay, we will head towards Stari Grad, the oldest settlement on the island of Hvar. Stari Grad (“old town”) was once the capital of the island, called “Pharos”, but has lost its leadership centuries ago to the city of Hvar. Even today, well-preserved monuments bear witness of the splendour of past times, like the Hektorović Palace. Stari Grad has, however, kept its role as the centre of viticulture on the island of Hvar and every year, at the end of September, you may witness long queues outside the wineries, when growers deliver their grapes. Overnight stay in Stari Grad. After breakfast, we weigh anchor and head towards the last island of our voyage – Šolta. The island is characterized by extensive olive groves, which produce first-class, extremely dark olive oil. For swimming, we anchor in a secluded bay which is accessible only by boat or canoe. Back from Šolta, we return to Trogir. Be captivated by the unique atmosphere in the streets of the old town, also called “the Museum City” and protected by the UNESCO. Before having the opportunity to have dinner in one of the numerous cozy restaurants, you are invited to take part in a guided tour through the historic town. Island Biševo | "Blue Grotto"